A curiously hot n' heavy listener request leads Patrick and Alex into a discussion of Keira Knightley's jaw, Tony Scott's ridiculous filmography and the things a 12-year old would find cool during this f'ing of the overly-directed 2005 mess Domino. 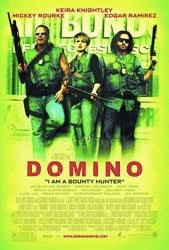 I finally watched Domino this week, which unlocked this age old podcast for me. Success!